Nature Posts: Fisher Sighting In Pennsylvania! I suppose I should wear a GoPro Camera wherever I go! This morning while driving over a mountain road we saw a Fisher come busting out of the woods and go dashing across the road a few yards in front of our car. I didn't have time to grab a camera before it disappeared down the mountain. In fact, all I had time to do was exclaim to my daughter, "There's a Fisher!" and by then it was only a memory. A Fisher looks about like a weasel or mink but it is almost the size of a fox or bobcat. I was surprised how gracefully and quickly the Fisher bounded across the road, considering its short legs. Another surprise was that we spotted this ridge-running Fisher on a forested Appalachian ridge that stands between valleys full of farms. We would have been less surprised if we would have seen the Fisher somewhere in the more rugged and remote Allegheny mountains... like where we were tracking a Fisher earlier this winter. 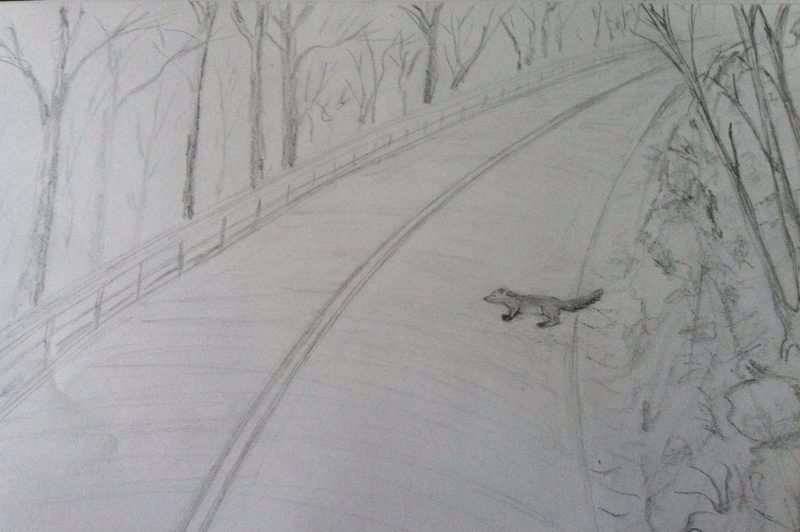 Our fleeting encounter with the Fisher was too sudden and short lived to have time to capture a photo, so I pulled out my sketch pad and drew a picture to recreate the moment I recognized the creature crossing the road as a Fisher. In the absence of a helmet-cam this rendering is the next best thing, eh? Oh, and I wonder... "Do Fishers visit chicken coops?" What a thrill that must have been ! I reckon the thrill came after the fact... when we were up around the corner and were re-living the experience.